You probably have many things on your home maintenance list or “honey do” list and, as the weather heats up, the amount of maintenance, particularly yard work, increases greatly. We understand that you do not need one more thing to do, but lock maintenance is something that can extend the life and functionality of your locks. Don’t worry! Lock maintenance isn’t something that will take up a lot of your time. Here are some things that you need to know in regard to the lock maintenance for you home in The Woodlands. Is the Door Properly Hung? If you are having trouble with your lock, check to make sure that your door is properly hung. If a door was not hung correctly, or is not any longer due to use, your lock will not function well. 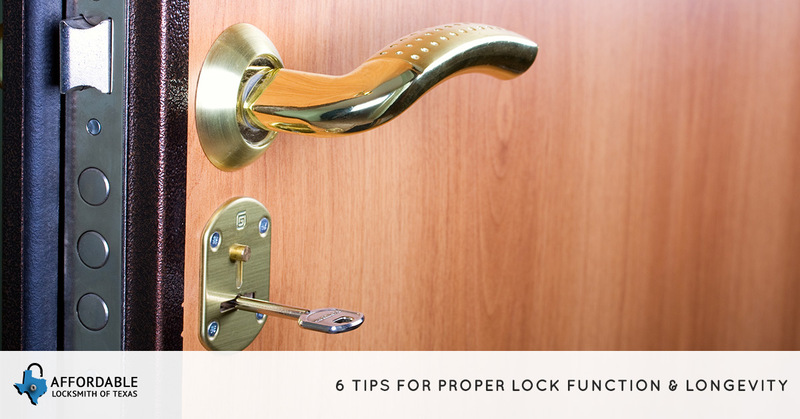 A door that sags, binds, or sticks will put an undue amount of pressure on the lock’s latch or bolt and the door won’t lock; or, when you try to re-enter your home, you may find yourself locked out. If you are having trouble with your lock, check to make sure your door is sitting properly on its hinges. Are the Screws and Strike Plates in Place? If your door is hung properly, next check to see if the screws and spike plate are in place; the spike plate connects the door to the wall or door frame. Check to make sure that the screws are tight and whether the screws are long enough to hold the door. If the screws are tight, but the door still sags, you may need to replace your screws because they may not be long enough or the door jam or plate may be damaged and in need of replacement. You should never have to lift, abnormally push, or pull the door to operate the lock. Your door’s lock will not function properly if the deadlatch hits the strike plate. If the lock isn’t properly aligned, the deadlatch will hit the strike plate and cause one of the important security features to not work. The same is true for the deadbolt. If the door or the lock itself is not properly aligned or the hole for the deadbolt is not deep enough, the door will not lock properly, and you are left with a security issue: The lock is only really “locked” when the deadbolt is fully extended. Have You Cleaned the Lock? If you have found that your door and all of your lock elements have been installed correctly, then the next step our locksmiths would suggest is for you to clean your locks. Though some manufacturers suggest the use of a gentle detergent, the best way to clean your lock is with a damp cloth. This will remove dirt and any other debris that have happened to build up in your lock, which can cause your the lock’s mechanisms not to function properly. When cleaning your locks, do not use harsh chemical cleaners; these chemicals will do more harm than good by potentially destroying the lock’s finish, impairing the locks functionality and it’s longevity. Locks, though fairly low maintenance, do need a little love and care through annual lubrication. When you lubricate your locks, check with the manufacturer or your local locksmith to find the right lubricant for your type or brand of lock. Generally, graphite or teflon lubricants are recommended, while you should stay away from petroleum-based lubricants. Once you’ve applied the lubricant to the lock, put the key in, turn it and pull it out, and wipe any excess lubricant from the lock. Repeat, until the key comes out clean. If you are still having trouble with your lock, next it’s time to take a look at the key that you are using. Is the key the original? If not, was it cut from the original key, or from another duplicate. As with anything copied from a duplicate, each copy will represent the original less and less. If you have the original key, try it in the lock and see how well the lock functions. If the original doesn’t work, then you may need to replace your key. Locks are made to outlast the keys that they come with. Call your local locksmith in The Woodlands to get a replacement and when you do get your replacement key, set one aside to be used when you need an accurate copy of your original key. Having Trouble With Your Locks? Contact Affordable Locksmith of Texas! We’d love to help you feel secure and protect those things and people that are most precious to you. We offer a variety of locksmith services for both commercial and residential customers, as well as provide transponder key replacement. We are 24-hour locksmiths who are licensed and insured, with years of experience and a customer first attitude that allows us to get the job done well and properly the first time. If you find yourself locked out or in need of other services, contact us and one of our locksmiths will be in contact with you within 15 minutes. We’d love to help your home or business in The Woodlands have the best security. Have questions about what kind of locks you need? Contact us! New customers get 10 percent off their first service!